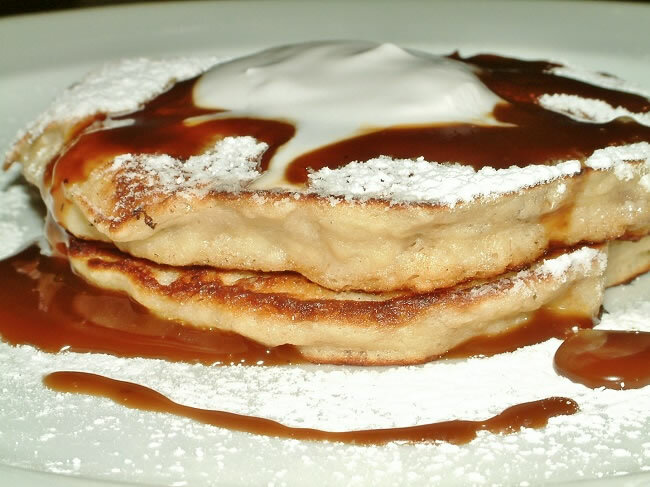 I made the Coconut sauce for these Banana Pancakes with Coconut Caramel from Gula Jawa ( coconut sugar). It is crumbly and resembles brown sugar. I love this stuff it’s different to palm sugar. The intense caramel flavour means it makes a perfect caramel sauce with out the slightest effort. Palm sugar and coconut sugar are not the same but are often all called by the same name. 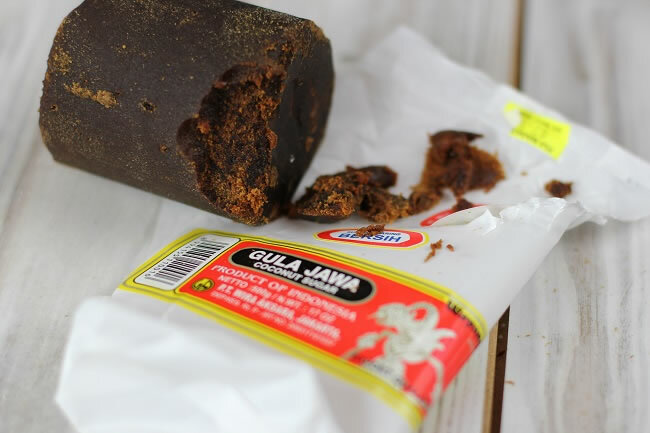 Gula Jawa is made from the blossoms of the coconut tree, where palm sugar is made from the sap. This one comes from Indonesia, but sugar is made from palms where ever they grow, so there are a lot of variations on the same sugar theme. It can be used as a substitute for refined white sugar or brown but it is very strong in colour and caramel flavour. The new buzz about coconut sugar is that it’s glycemic index rating is lower than other sugars at around 35 where, for example honey is around 55 and cane sugar about 68. Want to know how to make a beautiful caramel sauce? Ok, but you will need some other bits to go with it for this recipe. First, I like to use this Kara Coconut cream for this Banana Pancake. You can buy it in the supermarket or Asian store here in Australia. This is unsweetened and heavily thickened. Mash the bananas in a bowl ( or puree in a processor). Mix in the sugar, egg yolks, and coconut milk and butter. Combine well then stir in the (well mixed) flour and baking powder, till just combined. Beat the egg whites in a clean bowl till soft peak and fold gently through the pancake mixture. Heat a fry pan and cook pancakes in batches, any size you like. 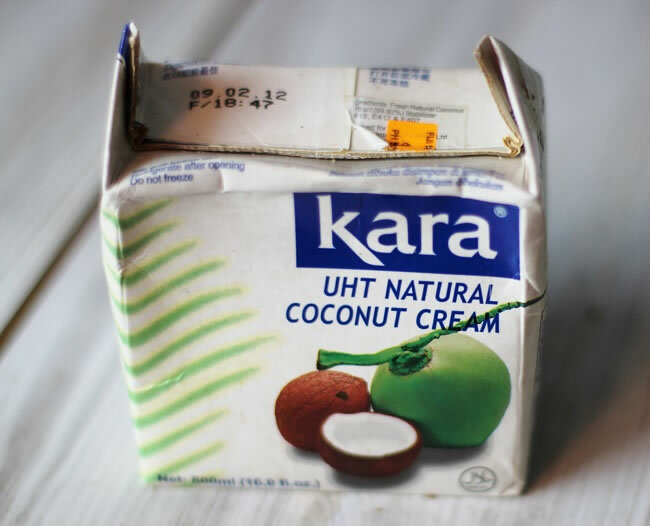 Chill a container of Kara coconut cream. It thickens up when chilled and can be used like whipped cream. I’ve been experimenting with coconut sugar recently. It’s quite a unique flavour isn’t it? I think it’s almost a little nutty. I would love a kilo of that hazelnut spread in my kitchen. Thanks for the tour Tania! 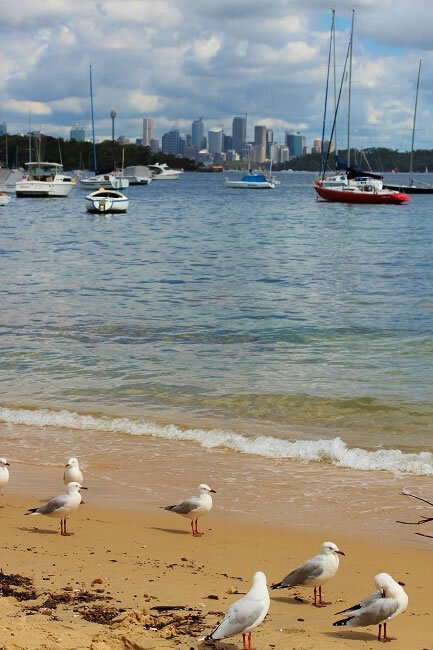 Claire @ Claire K Creations recently posted..Happy Easter! What tasty looking pancakes! And, I love Orecchietti, too! Hi Tana, I have never heard of coconut sugar. It sounds interesting, I think I will get some the next time I am at an Asian supermarket. I have some coconut sugar squirrelled away. Will have to dig it out because that sauce looks fantastic. Thanks for a peek in your kitchen. What fun things you have in your kitchen. I love cooking with coconut cream – it adds such a wonderful depth to a dish. What gorgeous ingredients. I use a lot of coconut milk and coconut cream in cooking but have never thought of chilling it as a substitute for cream on top of a dish. I do try to keep dairy cream to a minimum these days as we both need to be careful of expanding waistlines so that would be good! I’ll also try the coconut sugar. We have an Asian supermarket not far away. LOL at don’t judge. If anyone looked through my pantry I’d be jumping up and down to see what they were looking at. I know I’ve got stuff in there that needs to be at the tip. Coconut caramel sounds like heaven to me! Love those small ears..so adorable. 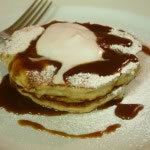 I wonder if the hazelnut paste could be homemade too…the pancakes look mouthwatering. Hazelnut paste sounds amazing! I’m going to hunt around over here in WA and see if we have it too! I have never seen coconut sugar look like that before. I usually buy it crystalised not cut with palm either. I do want to try the hazelnut paste it sounds so delicious. Oh, what a gorgeous looking snack! I can’t wait to get my hands on some of that coconut sugar. 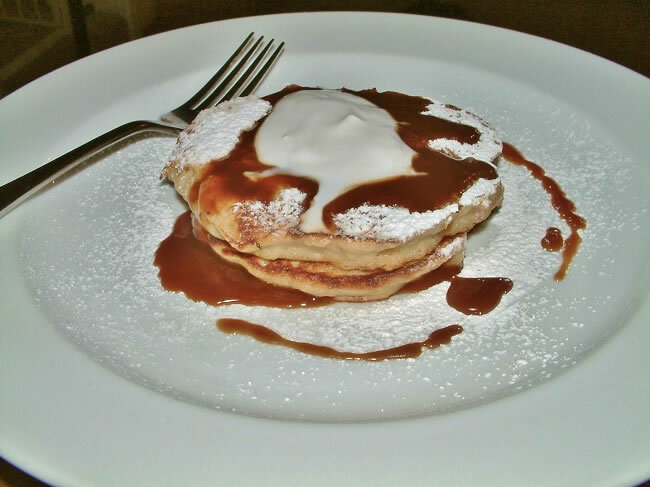 coconut caramel sauce sounds AMAZING! 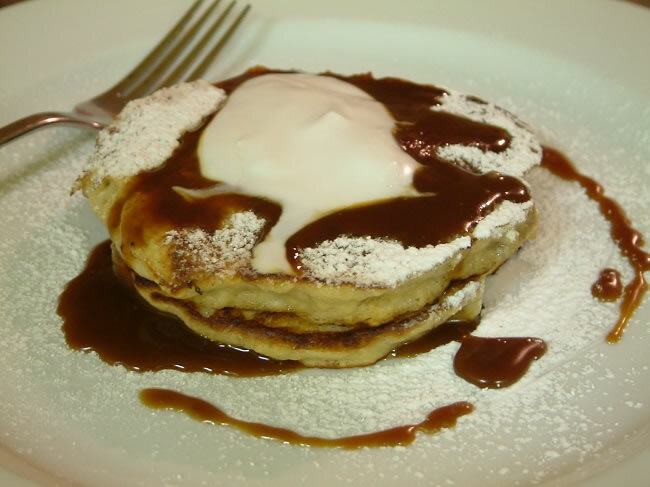 i always look at pancakes as a vehicle for some kind of yummy sauce, and this is the yummiest yet! That coconut caramel looks incredible! !